to familiarize yourself with the many valuable resources coming out of this workshop. solving, and peer review/publication (BioQUEST's three P's ). The laboratory sessions deal with medical, cell biology, and conservation examples. The lectures relate to: Evolutionary Bioinformatics: Orthology, Paralogy, Xenology, Phylogenetic Probes and Phylogenetic Profiling; BioQUEST's Curricular Philosophy: Problem Posing, Problem Solving and Peer Review / Publication; and, Theoretical, mathematical and computational aspects that complicate bioinformatics: homoplasies, computational complexity, numerous tree topologies, scoring multiple sequence alignments, long branch attraction problems, rate variations. The discussions focus on how to analyze data, how to implement bioinformatics investigations across the curriculum, and how to develop sustained collaboration. 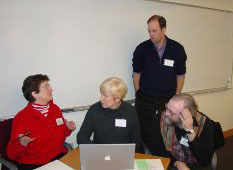 The workshop is designed for: -Biologists who are interested in implementing bioinformatics across their biology curriculum by incorporating bioinformatics into a variety of courses, using a problem-solving approach, and who enjoy collaborative learning such as has been developed and diffused by the BioQUEST Curriculum Consortium. -Mathematicians and computer scientists who are already involved in teaching bioinformatics or computational molecular biology are welcome to come and interact with biologists so that they can develop a better idea of what questions biologists outside of genomics have with respect to teaching and learning elements of bioinformatics appropriate to their sub-discipline of biology. are interested in developing their understanding of the biological (as compared to the computational or mathematical) aspects of bioinformatic analyses. in the development of biology or bioinformatics courses and/or curricula. University of Pittsburgh Chautauqua office. For more information please contact Sam Donovan or Sue Risseeuw (608/363-2012).